During fitting trials in Korea, 23 stainless steel panels have been successfully pre-assembled into the first sector of vacuum vessel thermal shield. As easy as that: the first 12-metre-tall sector of vacuum vessel thermal shielding was assembled in August from 23 stainless steel panels. One final operation—silver coating—remains to be completed before shipment to ITER. 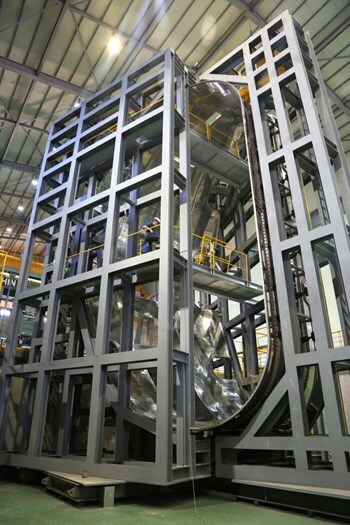 In a major achievement for the thermal shield procurement program, the pre-assembly test on the vacuum vessel thermal shield sector #6 has been successfully completed at SFA Engineering Corp in Changwon, Korea. 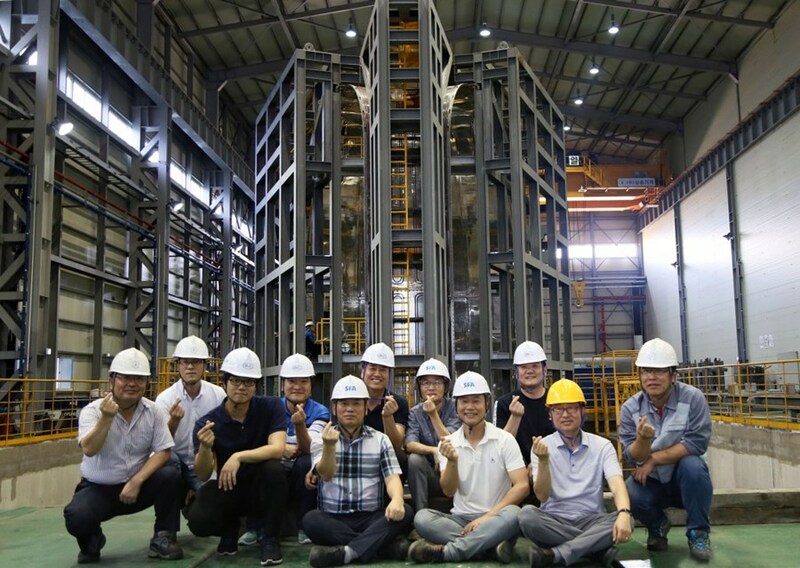 Technical responsible officers and engineers from the ITER Organization, the Korean Domestic Agency (ITER Korea) and SFA were there to witness the milestone, which took place in early August. The purpose of the pre-assembly test was to demonstrate the feasibility of assembling the same sector of thermal shield at ITER. The test jig and fixture design (inboard frame, outboard frame) and the clamping conditions were identical to those that will be called into action as part of vacuum vessel sector sub-assembly activities in the ITER Assembly Hall beginning next year on the sector sub-assembly tool. 10- to 20-millimetre-thick sectors of thermal shielding will form an actively cooled barrier between the (warm) vacuum vessel and the (cold) magnets. This 40° segment was pre-assembled in August to test tolerances and to test the feasibility of assembly at ITER. The vacuum vessel thermal shield is a 10- to 20-millimetre-thick barrier interposed between the vacuum vessel and the superconducting magnets. It will be actively cooled with gaseous helium at 80 K (minus 193 °C) to minimize the radiation heat load that is transferred by thermal radiation and conduction from warm components (vessel) to the components operating at 4.5 K (minus 269 °C) such as the magnets. Dimensional inspection of the shell was performed for the sub-assembled segments by 3D laser scanning. Observers were also able to verify the tight tolerances (2 mm) that are required for the 1,800 bolt holes of the sector. "Nine hundred bolts and corresponding holes were verified and all the flanges were assembled well without gaps," says Dongkwon Kang, ITER technical responsible officer for the thermal shield. "This gives us confidence that there will be no critical interface issues for the assembly and the operation of the vacuum vessel thermal shield at the ITER site." Vacuum vessel thermal shield sector #6 will now be dismantled for silver coating before being re-assembled into inboard and outboard segments for shipment to ITER. All is on schedule to meet the ITER Council milestone for delivery of the thermal shield sector by April 2019.